The rain stayed away on Friday, May 27th. With potentially threatening weather in the area,over 120 drivers made the pull to the Dacotah Speedway and fans were not disappointed. There was great racing action all over the track. 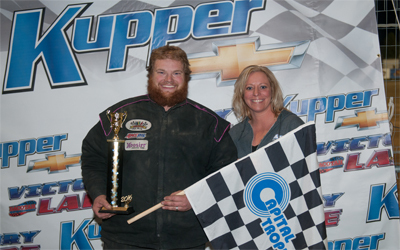 Stan Thompson and Dylan Sandberg battled for the lead in the IMCA Sport Compact feature. Thompson led the first lap as they continued to race door to door for first place. As Sandberg took the lead on lap two, Jamie McLain and Jason Berg split Chase Schlafmann for third and fourth respectively. Berg, who started tenth, passed McLain for third and quickly caught Thompson for second. Berg completed the pass for second and started to reel in leader Sandberg. With three laps to go, Berg was all over Sandberg's rear bumper. Berg looked high in turns three and four but Sandberg went up the track to block, allowing Berg to quickly dive low and grab the lead with two to go. Sandberg started to fall into the clutches of Josh Roehrich but Sandberg hung on to finish second. 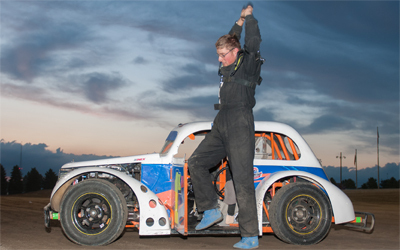 Pole sitter Jamie McLain finished fourth ahead of fifth place Stan Thompson as Jason Berg picked up his third feature victory in a row at the Dacotah Speedway. Pole sitter Dylan Thomas got loose and spun in turn four in the Hobby Stock feature. On a complete restart, Josh Roehrich and Kamern Glatt made contact battling for the lead, allowing Brent Vetter, Nathan Messer and Wyatt Rath-Wald to slip by before Thomas spun once more on lap four. Vetter continued to lead through a series of quick cautions before Messer took the lead with eight laps to go. It was a three car battle for the win between Messer, Rath-Wald and John Gartner Jr. However, a caution with two laps to go reset the field and on the restart, Rath-Wald took the lead, leaving Messer and Gartner Jr to battle for second. 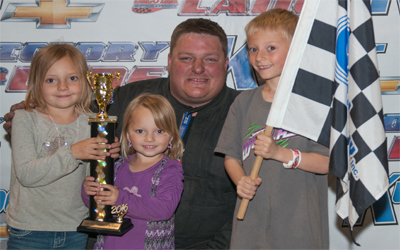 Wyatt Rath-Wald led the final two laps to win his second feature this season at the Dacotah Speedway. Nathan Messer used the low line around the track to hold off John Gartner Jr for second. Brent Vetter settled for fourth while Keith McCleary, in a brand new race car,finished fifth. Nate Keena grabbed the lead at the start, after starting seventh, in the INEX Legends feature. Shane Williams, who started eighth, was all over Keena's rear bumper. As the leaders raced hard, Donavin Wiest slowly started to reel them in. Williams dove low under Keena and took the lead on lap seven. Keena fell into the clutches of Wiest and as they raced for second, it allowed Troy Hoff to close in for a three car battle. A caution with two laps to go was the last thing Williams wanted to see. On the restart, Williams left the bottom open and Keena slipped by to take the lead with one to go. Keena picked up his first career INEX Legends feature win. Shane Williams edged Troy Hoff and Donavin Wiest by inches at the Open Road Honda finish line to finish second while Preston Martin rounded out the top five. 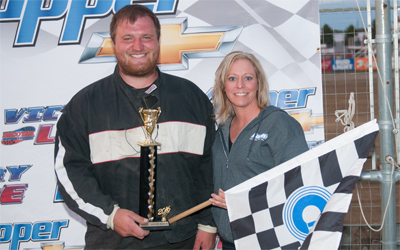 After struggling with his brand new race car for most of the season, Travis Ulmer finally found some speed as he started on the pole in the WISSOTA Street Stock feature. Ulmer led the first lap before Allan Frederick slipped by down low. A quick lap two caution gave Eric Harpole the opportunity to dive low under Frederick on the restart. They raced side by side for several laps until Harpole completed the pass on lap eight. Frederick then had to hold off a strong Shawn Volk for second. Hugging the guardrail, Volk passed Frederick for second and quickly caught Harpole. Feeling the pressure from behind, Harpole spun coming out of turn four, collecting Volk with five laps to go. Volk was able to continue and on the restart, Volk pulled away as Shawn Becker and Matt Dosch battled for second. Using the low line, Dosch passed Becker, bringing David Falkenstein with him with two laps to go.Despite racing a heavily damaged race car, Volk went on to win the feature. Dosch finished second while Becker made a last lap pass to finish third over Falkenstein. Zach Frederick, who started 24th, finished fifth. Donald Robinson and Brad Hartigan started on the front row of the IMCA Modified feature. 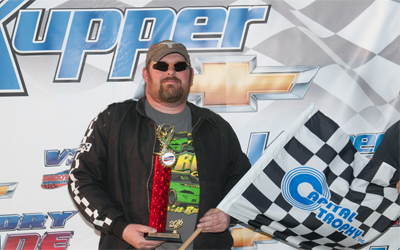 However, third place Jason Wolla got a great start and grabbed the lead when the green flag waved. Wolla's car was strong on the bottom and quickly pulled away from the field. Mark Dahl passed Hartigan for third and started to catch second place Robinson. Dahl, using the low line,took second from Robinson on lap nine. Despite Wolla's large lead, Dahl kept pace with Wolla. When Wolla started catching lapped traffic with 12 laps to go, Dahl started to close in. A caution with three laps to go regrouped the field but Wolla was much too strong. He pulled away once again on the restart and led all 25 laps to win the feature. Mark Dahl finished second while Spencer Wilson and Tracy Domagala passed Donald Robinson for third and fourth place respectively with two laps to go. Up next at Dacotah Speedway is Knife River night on Friday, June 3rd with all 5 Mandan Dirt Series classes in action. $12 for 13 and older. 12 and under are always free. Advance discount tickets available at select Cenex locations in Mandan, Bismarck and Lincoln. Front gate opens at 6, green flag flies at 7pm.